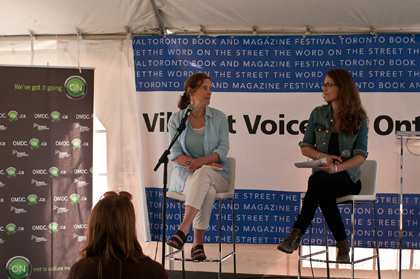 On the morning of the 25th annual Word on the Street festival (WOTS) in Toronto, I awoke at 7am to the dispiriting sound of torrential rain. I snuggled under the covers with the Sunday paper and guiltily wished I hadn’t made a commitment to go and stand in a tent for most of the day. I wished the rain would stop. I wished I owned a pair of wellies. At 8am, the rain was still hammering down. At 9am, thunder had joined the rain. By 9:30am I’d realized it was also humid. My hair had tipped me off: it was large. I began my now annual ritual of figuring out what to wear to a) be presentable in front on an audience, while b) standing exposed to the elements for four hours. I have learned that for Word on the Street, sartorial options are key. I left the house in T-shirt and jean-jacket, toting a scarf, a light sweater, a waterproof jacket, and an umbrella in a bag — just in case. But by the time I’d even made it as far as the front porch, the sun had struggled out from behind the clouds. And out it stayed for the rest of the day. The weather gods had smiled kindly on WOTS 2014. Krista Foss read from her debut novel, Smoke River. We talked about learning conversational Mohawk and rebutted the notion that one “graduates” from short stories to the novel. Lynn Thomson read from her debut memoir, Birding with Yeats. I asked her about birding (of course) versus her day job of bookselling, and about her groovily named writing club, The Moving Pen. Russian native Vladimir Azarov read from Sochi Delirium and I asked him why moving to Canada (not Paris, not Prague – Canada!) had inspired him to write poetry. Adrienne Weiss read from There Are No Solid Gold Dancers Anymore. We talked about a psychic on Queen Street and the way actors may become unable to leave behind their defining roles. Recent Quill & Quire cover girl Carrie Snyder read from Girl Runner and answered questions about running, tough career choices, and choosing a 104-year-old Aggie Smart as a protagonist. Gordon Henderson, author of Man in the Shadows, talked about making the transition from journalism to fiction, and why Canadian history is a lot more fun than you think. Claire Cameron read from The Bear, and then talked about the pros and cons of placing your narrative in the hands of a 5-year-old narrator, and the comfort (or terror) of story to make sense of tragedy. When my stint on stage was over, I took a stroll around Queen’s Park in the now-scorching sun to see what was what (or should that be “what was WOTS”?). I peeped into some tents to check out the programming (including sign language on stage at the Amazon.ca Bestsellers Stage), and said Hi to many friends manning magazine booths, who still had wet feet from setting up shop in the early-morning monsoon. Like the Coach House Wayzgoose (which I wrote about earlier in the month) WOTS is a massive end-of-summer coming together of the publishing crowd, but unlike almost anything else, it’s also a huge community event: fun, family friendly and free to attend. I met one of my best friends at my first WOTS, many chapters ago, and have had memorable conversations with both book-trade friends and book-reading strangers alike at every festival since. WOTS attracted a crowd of more than 200,000 this year. And when you consider than 5,000 sales can a Canadian bestseller make, those 200,000 represent a pretty significant voting block for the future of our business. Despite the eventual benevolence of the weather gods, one small cloud remained on the periphery of this 25th anniversary WOTS. This year marked the last that the festival would be held at Queen’s Park. Next year it relocates to Harbourfront Centre, and one can’t help but feel though it gains a new home it may lose a little something in the move. More than 200,000 people ambling around our city’s waterfront is already a weekend-ly occurrence throughout the summer, but 200,000+ book lovers taking over a giant, easily stumbled-upon section of downtown to spend a day – rain or shine – soaking up literary experiences has no equivalent. But that big change is a year away. With the Eden Mills Festival in Guelph and WOTS chapters across the country already having taken place, the 2014 fall festival season is officially underway. As I write, the Kingston WriterFest is in progress (in Kingston, obviously), and Toronto’s International Festival of Authors is a mere month away. Writers: it’s time to meet your readers. There are hundreds of thousands of them. I saw them with my own eyes last weekend. See you at the festivals, rain or shine.